The $45 million, 4,754-seat Icahn Stadium is 85 percent built. Light towers will provide illumination for evening meets. Today, as the Olympic high jump, hammer throw and heptathlon competitions begin, a new, never-used, spike-resistant, brick-red Olympic track is good to go. Scoring officials' tables? Completed. Twenty-two rows of sculptured blue polyethylene stadium seats? Waiting to be filled. 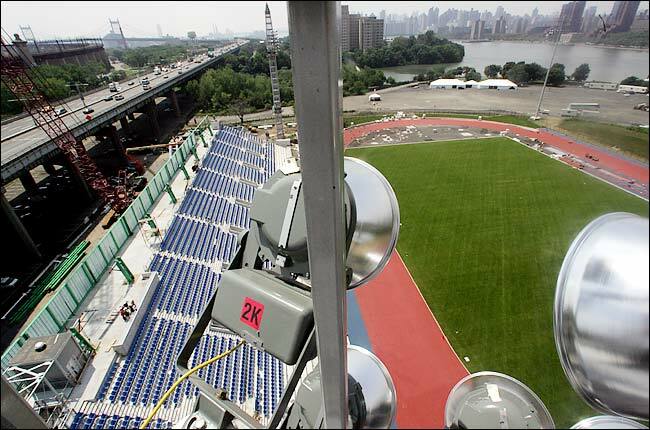 And banks of 2,000-watt floodlights are ready to illuminate sprinters as they explode off the blocks at night. No, not at the world-renowned 72,000-seat Athens Olympic Stadium, but on that new running track at Randalls Island that, for months now, has been so intriguing to motorists across the East River on the Franklin D. Roosevelt Drive. The $45 million, 4,754-seat Icahn Stadium, named after its principal private donor, the investor Carl Icahn, is now 85 percent built. And the already completed $1 million running surface is essentially the same as the one in the great stadium in Greece. It was installed directly after the Athens track by the Mondo company of Alba, Italy, the premier Olympic surfacer. "Randalls will definitely be a fast track," said Luca Reinaudo, the company's construction director. A good thing, because after the stadium itself is completed in November, its creators hope it will be a future site for Olympic trials in track and field, after its expected Class 1 certification by the International Association of Athletics Federations in Geneva. The city's parks commissioner, Adrian Benepe, said that to many track mavens, the completion of the stadium "will be a watershed moment for the reinvigoration of track and field in New York City." "I think it will inspire a whole generation of runners, just to know that they can compete on the same track as Olympic runners," he added. "Symbolically, it says that city athletes deserve a world-class facility, instead of a disgusting falling-apart track with crummy portable bathrooms and no place to change in." The commissioner was referring to the old runners' refuge on Randalls Island, the unlamented Downing Stadium - torn down in 2002 - where he once ran as a sprinter in his student days at Horace Mann. Originally called the Municipal Stadium in 1936, it was renamed in honor of John J. Downing, a Parks Department director of recreation, in 1955. Completed under the auspices of the Works Progress Administration, the 22,000-seat stadium was ready just in time for the American Olympic trials on July 11, 1936, presided over by President Franklin Delano Roosevelt and Robert Moses. (Jesse Owens won the 100-yard dash there and went on to compete in the Berlin Olympics.) And the Women's Olympic Team Trials were held there in 1964. It would be cool if they built another tram out to Randall's.